Posted September 12th, 2018 by Dan Weisberg & filed under Class of 2019, Press Releases. 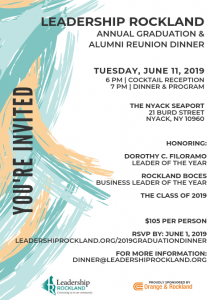 Posted January 18th, 2018 by Katie Beckmann & filed under Leadership Rockland Program, Press Releases, Rockland County. Posted September 18th, 2017 by Katie Beckmann & filed under Class of 2018, Press Releases.